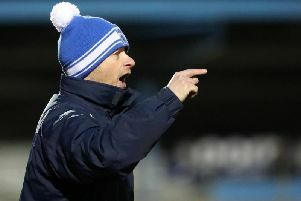 Michael McCrudden believes Institute must develop a tougher mentality if they are to continue their positive start to life in the Danske Bank Premiership. Since promotion, Paddy McLaughlin’s men have taken 17 points from their first 16 games and currently sit eighth in the table. They have also found themselves on the end of a number of contentious decisions, including last week’s defeat to Linfield. But McCrudden says they cannot allow it to be used as an excuse for a second half display which wasn’t up to the standards Institute have set themselves this season. “Had we got in at half-time against Linfield at 1-0 it would have been great to build on in the second half,” he said. “Even going in at 1-1, personally, I thought we could take something from the game whether it was a point or maybe three. “The second half just sort of fizzled out and I think everyone dropped their standards which made it easy for Linfield. “We need to improve on that. If we go behind early there’s still plenty of the game left to come back. “The only time I think we did it was at Coleraine when we were able to come back and draw 2-2. ‘Stute know they will be in for a tough afternoon when they travel to Crusaders on Saturday, who have won their last four games. They put Glenavon to the sword last week and midfielder Declan Caddell feels they are getting back to their best. “We have struggled to get our form going this season, but we had everything against Glenavon,” he said. “It all started with our work rate. We have quality players throughout the squad, and if the work rate is there then the results usually follow. “We’ve been ticking along nicely over the last three weeks, game after game we’ve been improving. “We’re getting back to our form of last year. “Stephen (Baxter) drives us on. When he sees a performance like that he knows that is the level we should be at. “He doesn’t want us to fall below that, that’s the one things he’s great at he will drive us on and look for us to keep improving so we can get those performances every week. “It’s similar to last year when we were 12 points behind at one stage, but we were able to claw it back.